The I-95 James River Bridge in Richmond, Virginia, is 4,185 feet long, six lanes wide, and a maximum of 96 feet high and it opened in 1958 as part of the Richmond-Petersburg Turnpike. Much of the bridge is comprised of elevated overland approaches. The bridge deck had a rehabilitation and a latex concrete overlay that was completed in 1979. Roads to the Future aerial photos of the bridge - Richmond Downtown Aerial Photos. I-95 James River Bridge, looking north toward downtown Richmond. The elevated interchange and highway to the left, is the VA-195 Downtown Expressway. Diagram showing construction method whereby prefabricated sections of bridge superstructure were replaced at night while two-way traffic operates on the other side of the bridge. The Virginia Department of Transportation (VDOT) had an official website about this project for the duration of the project, the I-95 Bridge Restoration Project website (www.i95bridge.com), and it was removed from the Internet soon after the project was completed in August 2002. It was quite informative and it had daily updates about the project and the traffic restrictions. I asked for and received permission from VDOT soon after the website was deleted, to utilize some of the material including photos, news releases and a movie of the construction method, on my website. The elements on my I-95 James River Bridge Restoration website articles, that are from the VDOT website, are marked by various statements "...by VDOT" to give appropriate credit. The project was completed in August 2002 at a cost of over $49.1 million. Map showing planned I-95 bridge reconstructions in Richmond. The lower red dot is the I-95 James River Bridge, and the second-lowest dot is the I-95 bridge over the Broad Street ramps. Both of these bridges were reconstructed in this project. Legions of motorists who have been idled by nightly traffic jams on Interstate 95's James River Bridge have reason to cheer. The project, which began more than two years ago, is done ahead of schedule - sort of. Yesterday's completion came days ahead of when crews had planned to finish, because a piece of necessary equipment was delivered ahead of the revised schedule. The work originally was to be completed in September, but construction delays and a revised work schedule designed to better accommodate Sunday night traffic slowed the efforts. "This has been a very challenging project," said Michael Schwartz, who oversaw the project for the Virginia Department of Transportation. The innovative reconstruction technique allowed crews to replace large sections of the bridge's surface at night and return the span to full travel capacity each morning. Though the reconstruction was projected to cost $43 million, discovery of structural and environmental issues raised the final cost to $49 million. Of that overrun, $3 million was for cleaning up lead paint on steel beams. Those beams were not visible during inspections of the bridge when the original cost estimates were done. Length: Three-quarters of a mile. Traffic: More than 110,000 vehicles per day, three times the amount envisioned. Sections replaced: 102 - 51 northbound; 51 southbound. This was a fascinating project to watch. There were a variety of vantage points where one could stand within about 150 feet of the bridge and watch the sawing, removal and replacement operations for the prefabricated sections of bridge deck, and there were a number of nights where I went there for several hours to watch the construction. Driving through there was also a good way to pass the construction zones and to get a glimpse of the construction operations, and I did that many times also. The Virginia Department of Transportation will be restoring 13 bridges along the I-95 corridor in the Richmond area during the next few years. The concrete driving surface and the steel that supports it will be repaired or replaced. The bridges are located between the Maury Street interchange just south of the James River and Upham Brook in the Route 301 interchange area in Henrico County. Why do the bridges need to be repaired? Are they safe? The bridges were built in the late 1950’s as part of the Richmond-Petersburg Turnpike. They have experienced heavy usage over the years, carrying three times the traffic at weights double than expected. Current traffic counts indicate more than 110,000 vehicles use the James River Bridge every day. Many of those vehicles are trucks carrying 40-ton loads. Weather has also deteriorated the tops of the bridges. The bridges are safe now, but need to be repaired to maintain long-term safety. How will the public be notified about the project? VDOT will be reaching the public through the media and other outreach mechanisms, such as a hotline, web page, newsletters, and more to make sure everyone knows about the project and how it could affect them. I-95 travelers may be inconvenienced at night. In order to minimize the impact, VDOT and URS Greiner Woodward Clyde have worked for more than a year planning and implementing state-of-the-art construction techniques. They have also developed a comprehensive communications plan to inform drivers about the project and show them alternate routes that may be more convenient. On-site construction will begin in spring 2000. Crews will replace a large section of the bridge surface each night (Sunday through Thursday). The work will be complete by September 2001. Construction will begin each night at 7 p.m. Crews will gradually divert traffic from one side of the bridge to the other. One lane will be open in each direction on one side of the bridge, while crews work on the other side. All lanes will be open to traffic by 6 a.m. the following morning. No work will be done on weekends or holidays. What will happen each night? Construction crews will cut and remove a large section of the bridge surface.The section will be hauled off the bridge and replaced with a new, preconstructed section. The bridge will be ready to handle traffic the following morning. This method was selected with extensive community input. VDOT and URS Greiner Woodward Clyde invited dozens of business, political and civic leaders to study the project and the construction options. The community advisory groups heavily favored night construction versus day or weekend construction. Once that recommendation was made, VDOT adopted it. The I-95 James River Bridge, which carries traffic through the city of Richmond, Virginia, will soon be restored by the Virginia Department of Transportation (VDOT). 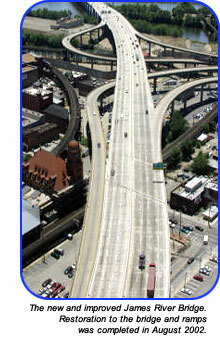 Starting in spring 2000, construction crews will begin replacing sections of the concrete bridge deck. All construction on the project will take place from 7 p.m. to 6 a.m. on Sunday through Thursday nights. During nighttime construction, one lane of traffic will be open in each direction. All three lanes of traffic on the I-95 James River Bridge will be open for the morning and evening rush hours. Periodic lane closures may take place between 9 a.m. and 3 p.m. This web site can help you avoid traffic delays and save you time. Each day, VDOT will check weather conditions and decide if crews will work that night. That decision will be posted on the top of this page by 3 p.m. each weekday. Just prior to the beginning of the I-95 James River Bridge deck replacement, continuous high mast lighting was installed on I-95 for 3 miles north of the bridge and for 2 miles south of the bridge, including lighting the Maury Street interchange, re-lighting the Broad Street interchange, and re-lighting the I-64 interchange; and this assisted in illuminating the entire area where nighttime lane closures occurred, and the new lighting remained in place after the bridge construction was completed. In the first year of reconstruction on the bridge, from mid-1999 to Spring 2000, extensive sub-structure rehabilitation was conducted on the piers and bents, and dozens of prefabricated sections of new superstructure (roadway deck and beams) were constructed in a large open area near the sewage treatment plant next to I-95 about a mile south of the bridge. On a construction night, one directional span was closed, and the other directional span carried one lane each way with a center emergency lane. Construction crews removed a directional span segment between adjoining bents, with 48-inch diameter concrete saws cutting longitudinal cuts in the roadway deck, so that a pair of cranes could remove individual sections of concrete deck slab with one steel girder attached. The old materials were hauled away. Crews prepared the bearing seats, and then a large caterpillar-like vehicle with rubber treads carried a new bridge span section from the fabrication yard to the bridge work site. The pre-constructed superstructure sections weighed up to 120,000 pounds each. Two large cranes teamed up to lift each segment off the vehicle, and placed it in its final location on the bridge piers.  So a single span segment has two sections, and they form one span of 3-lane roadway. The contractor typically placed one bridge span of 3-lane roadway per night of work. There is a series of long steel truss sections on the bridge, about 800 feet long, near the Main Street Station. The steel superstructure on this section was retained, and the reinforced concrete roadway deck was removed in sections, and replaced by pre-constructed sections of reinforced concrete roadway deck. This was performed in the nighttime sessions also. 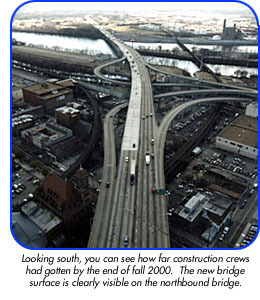 Deck replacement began on the northbound I-95 James River Bridge in June 2000 and was completed in June 2001. The reconstruction of the bridge, in June 2001, had reached halfway point, with the northbound bridge complete. Work then shifted to the southbound bridge, and a second deck replacement crew and crane was added soon afterward so as to speed up the work. Since bridge volume was about 4,800 vehicles per hour at 7:00 PM when the closure started, motorists were advised to consider alternate routes, since 2 lanes could not handle that much traffic. I-95 traffic backed up for a couple miles at times during the early evenings. Volumes dropped steadily and at 10:00 PM it was down to about 3,000 vehicles per hour, and traffic usually flowed freely from then until all lanes reopened at 6:00 AM, albeit traffic moved slowly at about 40 mph. The AADT (annual average daily traffic) on the bridge at the time of the project was over 110,000 with 9% large trucks. Construction did not occur on weekends, holidays, or during bad weather. During construction nights, it was necessary to stop all traffic for up to 10 minutes at a time, about twice a night, so that the large caterpillar-like vehicle with rubber treads, could carry the new bridge span sections across the highway to the bridge work site. State troopers would stop the traffic during these times. This movie describes how the 43-year-old bridge would have sections of superstructure (deck and beams between two adjacent sets of bents) removed, and how new prefabricated sections would be put in the same place. Click icon for 3.8 MB Quick Time Movie, which was on VDOT's I-95 Bridge website. Fixed and variable message signs were utilized to provide messages to motorists during construction periods on this project. 1). I-295 - for I-95 long distance traffic passing through the entire Richmond-Petersburg area. 2). I-195, VA-76 Powhite Parkway, VA-288 - this route was construction-free and essentially Interstate standard, albeit about 11 miles of extra travel. Local traffic to/from Petersburg and Colonial Heights wanting to bypass Richmond could utilize this. Long distance traffic to/from the I-85 corridor wanting to bypass Richmond could utilize this. 3). I-64, I-64/I-95, I-195, VA-76 - for traffic passing through the Richmond northeast/southwest corridor. 4). The local traffic I-95 relief route was Bells Road and US-1/US-301, between the I-95 Bells Road interchange (Exit 69) and the Chamberlayne Avenue interchange (Exit 76). Bells Road is 4-lanes divided and US-1/US-301 is 6-lanes divided, and both are arterials and are not limited access. 5). I-195, VA-76 Powhite Parkway, VA-150 Chippenham Parkway - a freeway with 4 or more lanes (mostly 6 lanes). It did what "2" above did without the long extra distance, and it did most of what "4" did without urban street running. Why it was not official (in my opinion) - VA-150 still had almost 5 miles with 6-lane widening under construction, and there was a slow (40 mph) temporary 4-lane roadway for VA-150 under the new Route 895 bridge construction at the I-95/Route 895/VA-150 interchange project. Because of the major construction, it (I-195, VA-76, VA-150) was not one of the official alternate routes, but I'm sure that many locals utilized it as an unofficial alternate. The Route 895 Pocahontas Parkway was completely opened to traffic by September 2002, and the VA-150 Chippenham Parkway widening was completed by June 2002. These will provide important traffic alternate routes when the remaining 11 bridges in central and north Richmond are reconstructed in the near future. The project was completed on August 2, 2002. The prime contractor, Archer-Western Contractors, finished well short of using up the 179 nights allocated for construction to closing one span and detouring single-lane-each-way traffic to the other span. The Virginia Department of Transportation (VDOT) won top honors for its campaign to involve and inform the public about the restoration of the I-95 James River Bridge in downtown Richmond. The American Association of State Highway and Transportation Officials (AASHTO) presented VDOT with its most prestigious award, the Excel Award for Excellence in Public Relations, during the National Transportation Public Affairs Workshop in Juneau, Alaska, in August. The Excel Award is given for best overall communications program among departments of transportation across the country. One judge noted that VDOT's program was "very comprehensive and innovative... excellent plan, carried out with great strength from start to finish... obviously a great team brought this concept to fruition." VDOT, with the assistance of a communications firm, launched a carefully thought out communications plan that was based on research and community input. The goal of the plan was to increase awareness about the project and encourage motorists to use alternate routes during the nights of construction. VDOT did not want the public to be caught off-guard with the construction. The plan involved community meetings, creative advertising, employer and legislative outreach, strong media relations, emergency communications and the use of a wide range of communications materials to include a website and hotline number, newsletters, posters, press packets and other items. According to a survey of communications efforts, nearly 90% of bridge users were aware of the project before they were affected by it and nearly half of motorists changed or planned to change their driving routes to avoid construction. With increased public awareness and understanding of the project, the construction process is smoother and safer for all involved. I-95 James River Bridge Project Deck Replacement - 6 Roads to the Future photos of the bridge deck replacement. Zipper Machine on I-95 James River Bridge Project - 6 Roads to the Future photos of the Zipper Machine in operation. I-95 James River Bridge Restoration - Photos - 5 aerial photos of completed project taken by Roads to the Future, and 9 photos of construction taken by VDOT. Prefabricated Bridge Elements and Systems: A Winning Idea, from the Federal Highway Administration (FHWA). PrNEWS, Fall 2001, a publication of the AASHTO Administrative Subcommittee on Public Affairs (.pdf, 345 KB). Has details of the award that VDOT received on the I-95 James River Bridge Restoration Project. James River Bridge Work Shifts into Final Phase, VDOT news release, December 4, 2001. James River Bridge Construction Turns A Corner, VDOT news release, August 6, 2001. Copyright © 2001-2003 by Scott Kozel. All rights reserved. Reproduction, reuse, or distribution without permission is prohibited.